Tinnitus Relief is aimed to persons suffering from tinnitus. It can be downloaded on App Store if you have an iOS device or Google Play if you have Android. It can be greatly distressing when tinnitus first presents itself. This may be expressed as sleepless nights, concentration difficulties, tension, irritability and restlessness. The resulting stress could result in an even greater focus on the tinnitus. In my experience, the sooner you can break this vicious cycle, the better. Your tinnitus will bother you less, and the symptoms will recede and may even disappear. 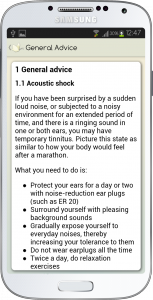 Tinnitus relief contains a fact sheet describing what tinnitus is, how common it is, possible causes and what might make the condition worse. The mechanisms behind hypersensitivity to sound are also explained. 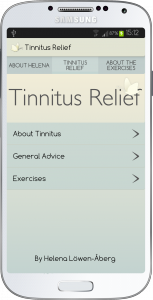 It provides exercises and advice to help you cope with your tinnitus in the best possible way. Tinnitus relief will also provide relief for anyone with a history of tinnitus, but where the situation has become more troublesome for some reason. 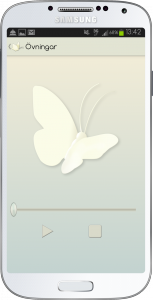 In addition, you can apply the measures in this app in preventive manner, to protect against hearing loss and tinnitus. • A 12-minute “sleep ease” exercise that will help you settle down and sleep. The more you do the Tinnitus Relief exercises, the easier you will find it to relax, and your tension and anxiety will recede. You will be able to concentrate better and a serene, positive mindset can take root. Tinnitus relief is conceptualized by Helena Löwen-Åberg, certified physiotherapist with a Masters degree. In addition to specialist competence in the areas of psychiatry and psychosomatics, she is a cognitive behavioural therapist, a professional supervisor and a mindfulness instructor. I would like to express my gratitude towards everyone involved in the development of this app and the people who helped me by researching facts and proofreading. Christer Borg, certified psychologist and psychotherapist in Gothenburg. Barbro Källén, certified physiotherapist and occupational therapist at Fungera Göteborg AB. In connection with the English version, Anja Bergh translated the exercises and that’s hervoice you hear, while Ingrid Eng translated and edited the written material – thank you both.